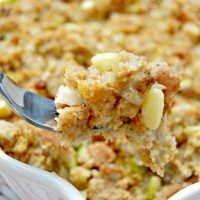 This Cornbread Stuffing Recipe with apples and pecans is so delicious. You can leave the apples and pecans out of course, but I think they kick this dressing recipe up a notch and give it so much flavor. Your Thanksgiving guests will be begging fo seconds of this delicious side! In a large pot, melt butter and cook onions, celery, apple, a pinch of salt and a pinch of pepper until softened. Next, add stuffing mix, pecans and chicken stock. Stir until the stuffing mix is coated with stock and the vegetables and apple are mixed throughout. Add stuffing mix to the casserole dish. Cover with foil and cook covered for 30 minutes. Remove foil and cook for an additional 30 minutes.